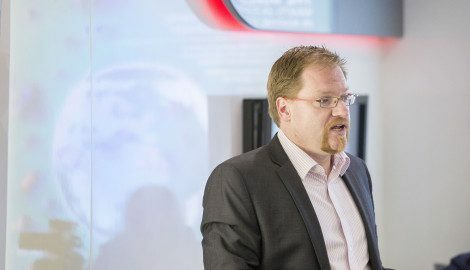 Eight weeks after the formation of Silverstone Technology Cluster – the company set up to lead promotion of the region surrounding Silverstone as a global hub for high-tech activity and capability – we caught up with its busy Chief Executive Officer Pim van Baarsen. Already STC has held its first board meeting (inside Silverstone Park’s Innovation Centre) and Pim feels its members have truly hit the ground running. To re-cap these comprise Silverstone Park developer MEPC, Barclays, Aylesbury Vale District Council, South Northants Council and Cherwell District Council, Hexagon Manufacturing Intelligence plus accountancy and law experts respectively Grant-Thornton and EMW. Brackley companies TotalSim (computational fluid dynamics) and KW Special Projects (integration of new processes and technologies) complete the board. “It was very good for everyone to meet – some for the first time – and discuss things moving forward; plus the input from KWSP and TotalSim is invaluable,” comments Pim. “Chiefly we concentrated on the Cluster’s three main strands: promotion, growth agenda and thought leadership. Growth agenda and thought leadership provoked a lot of debate, naturally! To re-cap, STC was born out of an in-depth report that proved the existence of a region (within an hour of Silverstone) that is exceptional for being home to such a high concentration of cutting edge engineering companies. We’re talking approximately 4000 companies – a staggering number – with many of those feeding sectors including aerospace, automotive, defence, energy, marine and medical with their specialist skills in such as design, manufacturing and electronics. As CEO you must be faced with a huge amount of work? “Ultimately there needs to be a lot of joined-up thinking but you must remember it is still very early days. At the moment there are a lot of meetings to be had; I see this phase as a scoping exercise to see what is out there. I’m talking to potential members to find out what they might need and how we can help them. What sort of initial feedback are you getting? Is one of the reasons for that because most of these companies’ focuses lie elsewhere? “I’d say there is some truth in that. A lot of them are engineering firms who are heads down coming up with solutions to problems and they enjoy doing that. But so busy they either haven’t had the desire or inclination to go out there and explore the landscape in terms of investment and growth, skills transfer and so on. “You can email me direct pim@silverstonetechnologycluster.com or sign up on the website. “We’ve scaled the membership fees according to the size of companies – there are options to be an associate member but the main benefits are in full membership and I believe the prices are reasonable.